It’s that time of year again, the best time of year for football fans: The NFL playoffs are here! Wild Card weekend always has the potential for some surprises, and I’m really excited about the AFC side of things with three newcomers in play. That probably bodes well for viewership, which has been down across the league this season, but I don’t see many upsets coming from it. This year, I think the division winners are the stronger teams across the board. This is going to be a good matchup between two teams I used to play for. You have a young team with little experience vs last year’s NFC representative in the Super Bowl, two teams with a lot to prove. I give the edge to the Rams based on their offensive firepower. The Falcons have not been consistent this year, and they didn’t catch that late-season fire like they did last season. 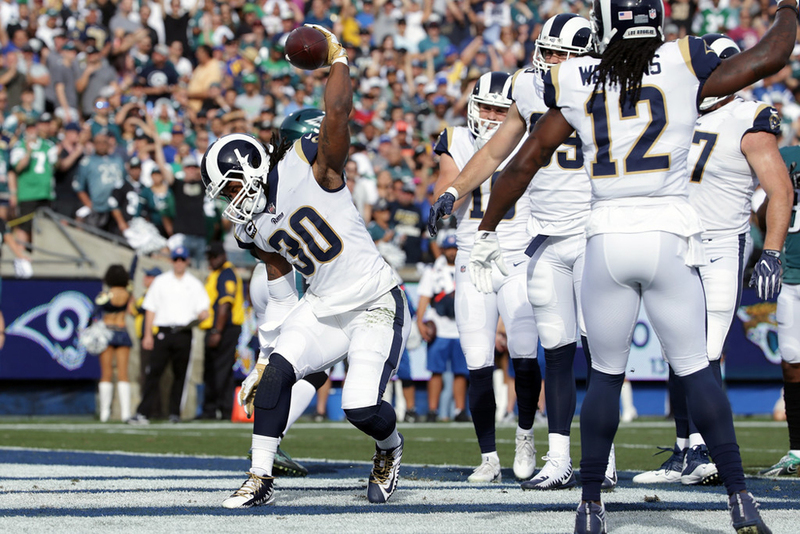 The Rams starters ended the season on fire, and they got their week of rest last week. I also think the cross country travel could play a role for Atlanta, and for the Rams, hosting their first postseason game in Los Angeles, it’s going to be quite the atmosphere. That plus the inconsistency of Atlanta’s performance this year — whereas LA was pretty consistent — leads me to give this one to the home team. The first home playoff game in Los Angeles? That’s cause for excitement! (Getty Images). This is likely to be the best matchup of the weekend. Two divisional foes who know each other very well, just going at it. I believe the combination of Drew Brees and the running back tandem of Mark Ingram and Alvin Kamara puts New Orleans over the top in this one. I like Cam, but if Carolina falls behind, they can’t play Panthers pound-the-rock football, and they don’t have enough on the offensive side to go keep up with the Saints. The Saints’ offensive weapons and playing in the Superdome will bode well for them. When you have two teams that know each other really well, I usually say give the nod to the home team. Experience wins out over youthful exuberance in this one. Andy Reid and Alex Smith are a good combination at the top for Kansas City, and in their time together, those two typically get out of the first round before running into problems down the road. This year should be no different. Tennessee is still a little bit away from making noise in the playoffs. They’re not only a young team, but they have a young quarterback in Marcus Mariota who has some learning to do. The loss of DeMarco Murray leaves Mariota with a young running back, too. Tennessee is going to be a formidable team in the next 2-3 years, but I don’t think they’re there yet. This year is more of a learning curve for them. I don’t think they get out of the Wild Card round. Here you’ve got two true AFC old-school football teams, pounding the football and playing defense. 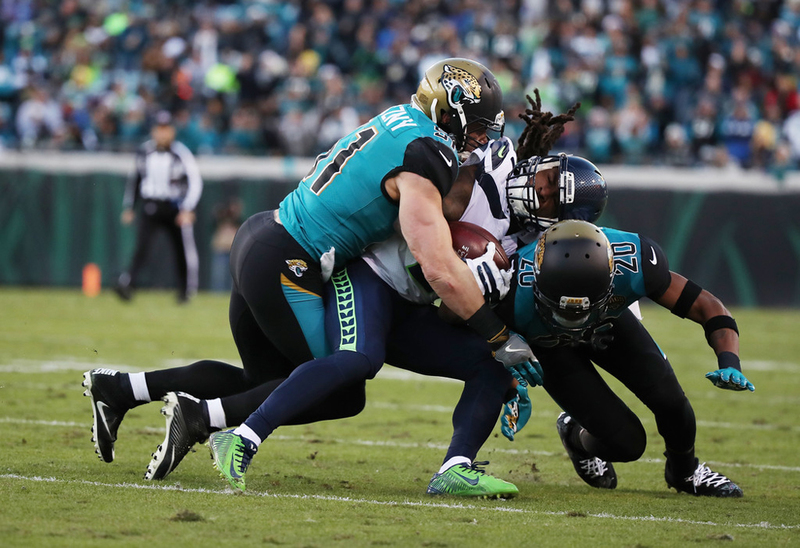 Don’t be surprised if the Jags defense dominates the day on Sunday (Getty Images). I see Jacksonville dominating this game as a defense. There will probably be some turnovers on both sides. But I think the Jags are going to smother Buffalo and be stingy in allowing yardage and points, especially if McCoy is out. And then Jacksonville has that ground-and-pound offense, too, which I believe bodes well for them and helps them advance to the next weekend. That’s how I see it playing out. How about you? I’d love to hear some picks from you, the fans, here in the comments, or on Twitter, @SJ39!